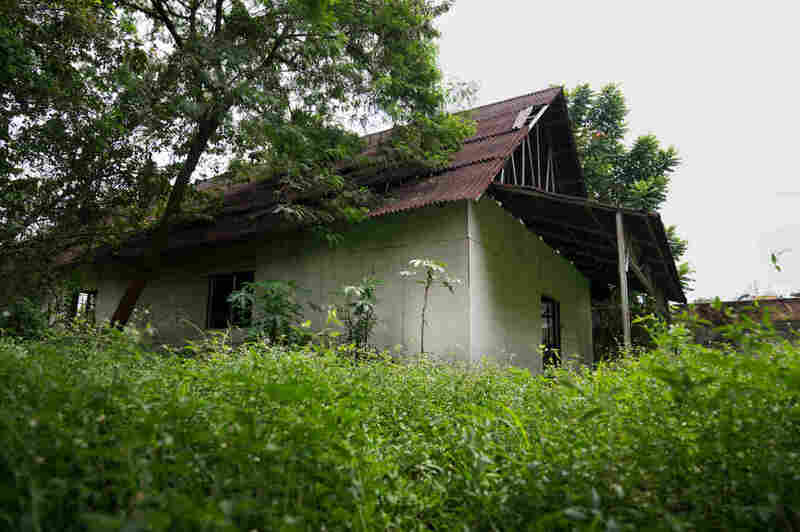 'It's Our Right': Christian Congregation In Indonesia Fights To Worship In Its Church : Parallels A Christian congregation outside Jakarta built a new church legally, but Muslims in the area object to it. In 2010, the Supreme Court ruled to allow worship at the church, but it remains sealed. The last service held at the GKI Yasmin church in Bogor, outside Jakarta, was at Christmas in 2010, when a mob forced worshippers to leave. The church has remained closed since. The local government acquiesced to the demands. But the church group went to court, and won. On an appeal, they won again. Finally, the case went all the way to Indonesia's Supreme Court — where the church group won a third time, in 2010. But to this day, the congregation can't worship there. Alex Paulus, a Christian leader in Bogor, says when the group started building the church, his children were still in elementary school. 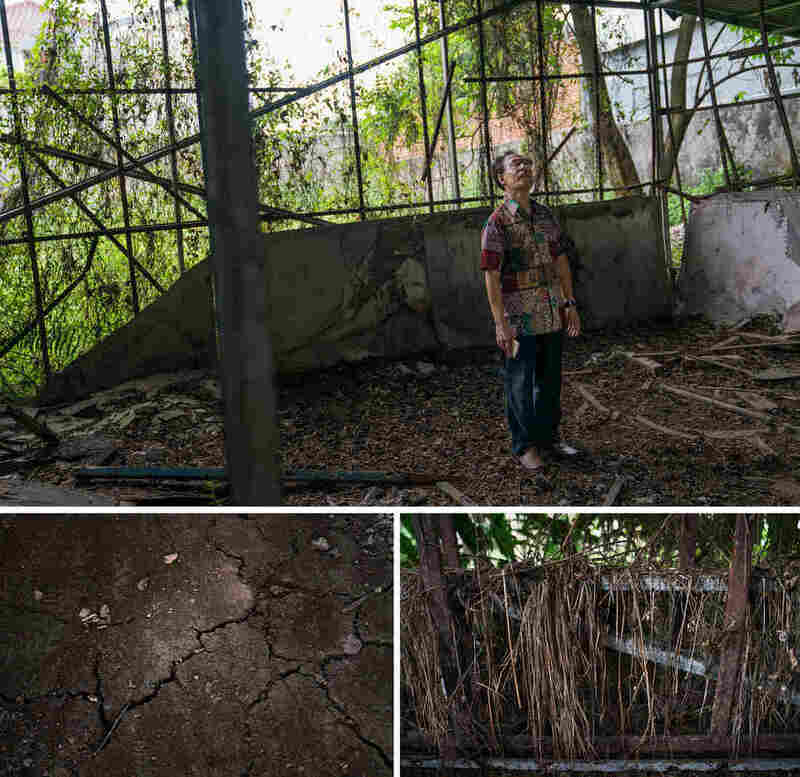 (Top) Alex Paulus, a leader of the Christian community in Bogor, stands in the shell of the church. (Bottom) Inside, the floor is cracked and the walls are overgrown with weeds. "But now," he says, "they already finished the university." Early on, the church was sealed by local authorities, but the community held Sunday school classes on the street in front of it. That left them vulnerable to attacks by hard-liners. "They yell at us, shouting at us, saying, 'Kill them, burn them!' " says Paulus. "So it terrified the kids." Alex Paulus and Yohannes Yudyharijono cover the opening to the church. (Top left) A wreath still hangs on the wall from 2010 when the congregation tried to celebrate Christmas and was forced out of the church. (Top right) A gold cross is painted on the altar. (Bottom) Yudyharijono, 69, looks out the window of the overgrown Yasmin church. "This is just a statement coming from people like Barack Obama, Hillary Clinton, all Western leaders who want to praise Indonesia for various reasons — sometimes justified, sometimes just for lip service," he says. The court ruling in favor of the church has been settled for seven years. But Bogor's mayor continues to ignore the ruling. Today, the church compound remains closed off. It is illegal to go inside. A metal sheet blocks the entrance. We were able to take a quick look inside and found a bare frame with a roof but no insulation, no walls — just a skeleton of a building. 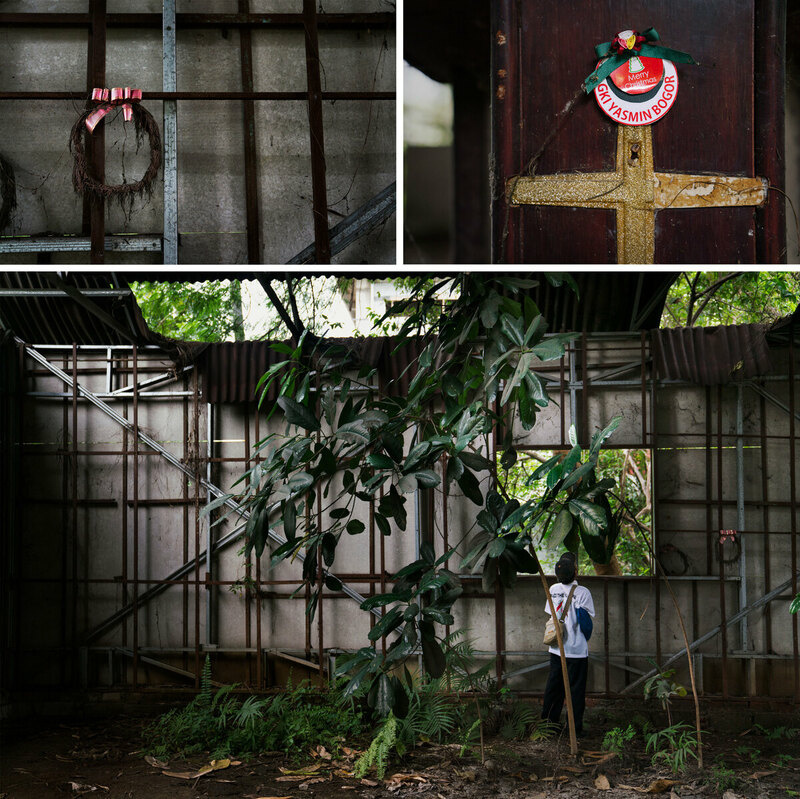 In the middle of the dirt floor, there is an altar with a gold cross painted on it. Hanging on the walls, there are little wreaths with ribbons from a 2010 Christmas service, when the community was forced by a local mob to leave the church building. At a mosque in Bogor, people say the Muslim community is divided over the church. Hizbut Tahrir, an Islamic group that Indonesia's government recently banned for its extremist positions, had encouraged protests against the church on social media. Mohammed Ismail Yusanto, the banned group's spokesman, lives in Bogor. 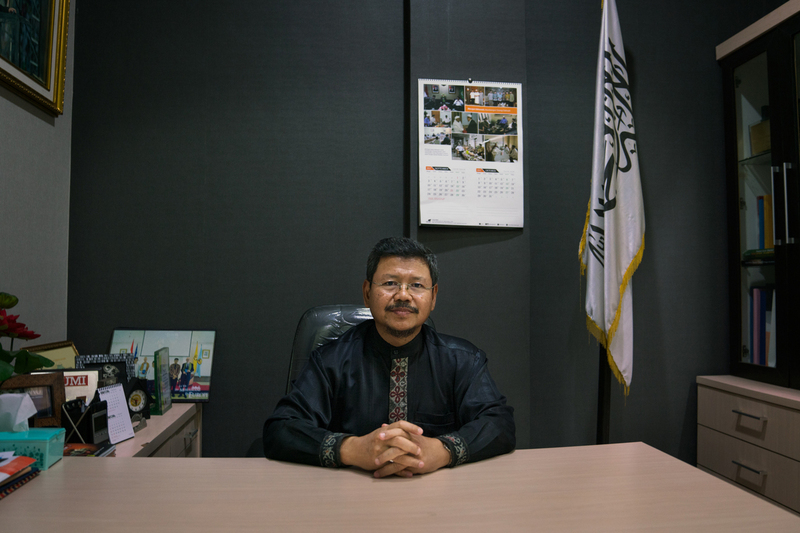 Mohammed Ismail Yusanto is a spokesman for Hizbut Tahrir Indonesia, a banned Islamic group that wants to create a global caliphate. The group encouraged protests against the church on social media. "Indonesia is very, very tolerant," he says. "I think too tolerant in some cases." Yusanto brushes off the Bogor church story as one isolated case. 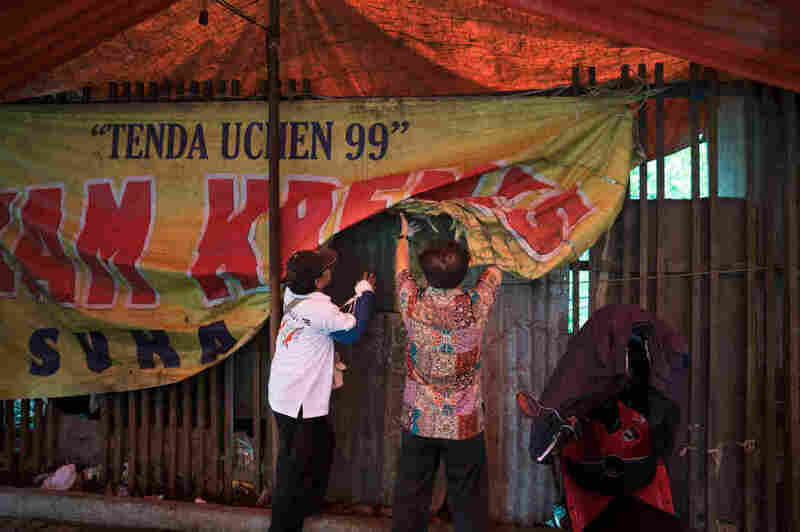 But in fact, Harsono says, 1,000 or so churches have been shut in Indonesia in the past decade. Paulus stands in the shell of the Yasmin church. He hopes to one day be able to practice his religion in safety. Meanwhile, thousands of mosques of a persecuted minority sect, the Ahmedi, have also been shuttered — another sign of growing intolerance, say human rights advocates. For Paulus, the numbers are less important than the personal question of one's own right to worship. 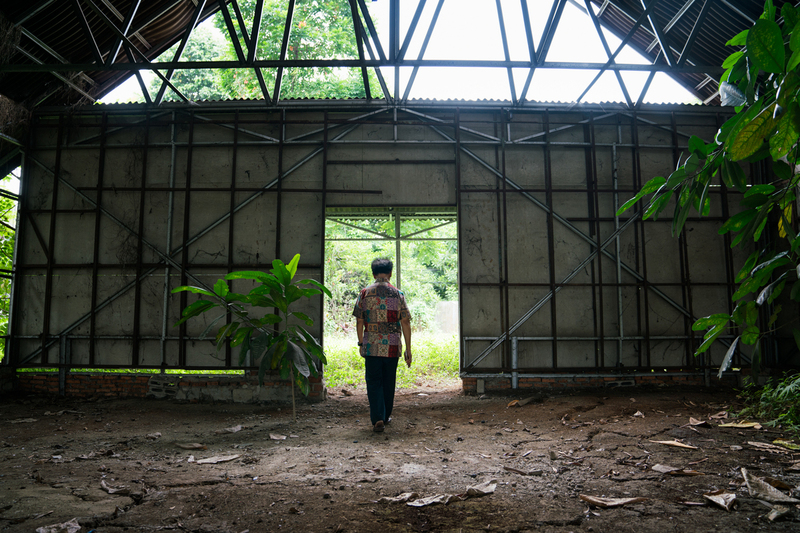 As he stands among the weeds and mosquitoes in the shell of the church, he says a prayer for the church to open. He is determined to keep fighting. "Because we have permission," he says. "It's our right."